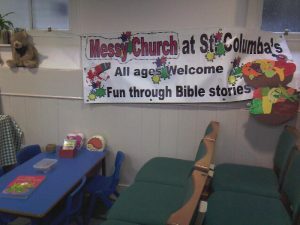 St Columba’s Church was open on Saturday 13 September for its first Jigathon. 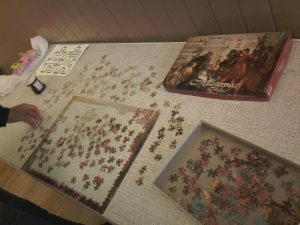 During the course of the day, participants managed to complete 17 jigsaw puzzles, and raised over £200 in sponsorship for church funds. At the same time, the church was open for Heritage Open Days (www.hodstw.org.uk). A slow trickle of visitors came to look round the building and see an exhibition of elements of the church’s past, present and future. 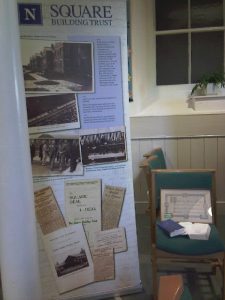 Displays included memories of World War 1, the church’s social landlord the Square Building Trust, Messy Church, Operation Christmas Child, and a rolling slide show of current activities. One visitor, a keen photographer, took a great interest in our stained glass windows (which you can see on the gallery page of this website). A group of children who had enjoyed jigsaw puzzling had a great search for church mice! 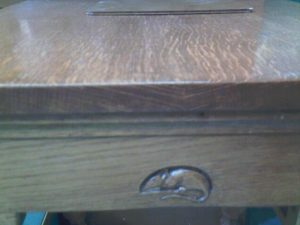 We found 5 of them, carved into our wooden church furniture – a whimsical trademark of “Mouseman” Robert Thompson of Kilburn. All in all, it was an enjoyable day of opening the church to those interested in heritage and puzzling. On Sunday 3 August 2014, we marked the centenary of the outbreak of the First World War. In our morning service at St Columba’s, members shared stories and memorabilia of uncles and grandfathers who had served in the Northumberland Fusiliers, the Durham Light Infantry and the King’s Own Scottish Borderers. Some had survived the war, and some lay in graves on the Western Front. Letters home showed that they had no expected not to return. Our Minister, Revd Liz Blair, reflected on the spirit of community and helping your neighbours, forged in war time, but still evident in her childhood. 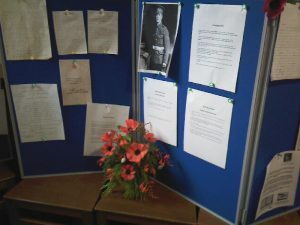 A small exhibition had been organised in the war memorial corner of the church. 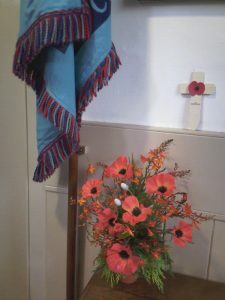 There were poppies, photographs, medals, postcards, stories, and pages of information about the soldiers from our church. Some of their letters were displayed, giving a flavour of life on the Western Front, mixed with humour. Notable was the soldiers’ gratitude for parcels of cigarettes and razors. One told of being sent to dig a grave for a dead comrade during a lull in fighting, only to have to dive in for cover when shelling started up again. 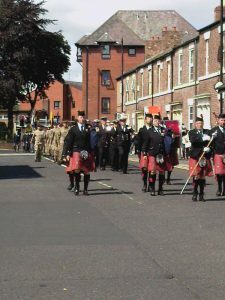 A local community group, Tynemouth World War One Commemoration Project, had done a huge amount of research into nearly 2,000 men from the then County Borough of Tynemouth who had died in the war. In addition to a map and an extensive online database, they had also published a booklet of information about the war as it affected the borough. 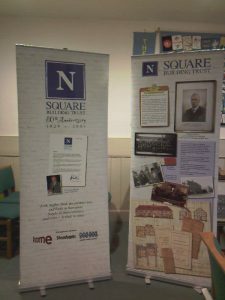 St Columba’s was one of many organisations that had sponsored the booklet so that it could be distributed for free to all school and college pupils in North Tyneside. 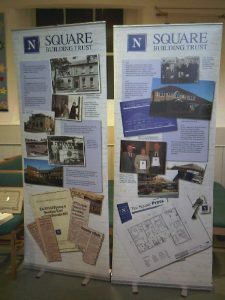 At 2pm, a public commemoration took place in Northumberland Square, organised by the Project in conjunction with North Tyneside Council. 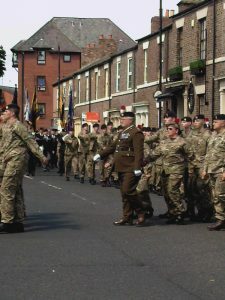 Local soldiers and veterans marched there from the Linskill Centre about half a mile away. Scouts and local faith leaders were also present. The event was hosted by Adrian Pitches of BBC Look North, and was addressed by Cllr Tommy Mulvenna, Chair of North Tyneside Council, Sir Nigel Sherlock, HM Lord Lieutenant for Tyne & Wear, and the Project’s Bill Griffiths. 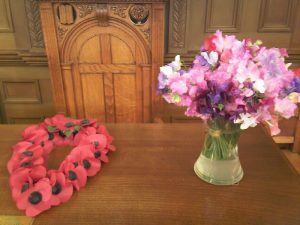 Revd Liz Blair led the service, which included traditional hymns, prayers of thanks and protection, a bugler and piper, two minutes’ silence and 2,000 sweet peas laid by the Scouts in memory of the dead. The service ended with the National Anthem. Fortunately, the weather, although windy, held off to enable the event to take place in the open air. St John’s, Percy Main, celebrated its 150th anniversary with a flower festival, and invited Churches Together in North Shields to join them for Pentecost praise. The church was full, and more chairs had to be brought in to accommodate the congregation. Vicar of St John’s Revd Helen Gill led the service of worship, with other members taking part. The story of Pentecost from Acts chapter 2 was retold in modern language, punctuated by the refrain, “It was weird… but wonderful!” Helen spoke briefly of the coming of the Holy Spirit, and reflecting that experiencing the Spirit can be different for everyone, with each person receiving individually hand-crafted spiritual gifts. Planning the flower festival had taken 9 months of preparation, and had formed new friendships with people from other churches and organisations in the area, who had helped in decorating the church. A slide show was given, showing the floral displays being assembled and then completed. The service concluded with releasing party poppers and sharing in a celebration cake, after we had all greeted each other and shared the peace. The flowers themselves were ingeniously displayed – some arranged in the form of anchors and cranes, and filling various shoes around the church. Displays included the work of the Fishermen’s Mission, over the rainbow (with red shoes on a yellow petal road! ), the Port of Tyne, a table and armchair set for afternoon tea, memories of the Great War, Mary Mother of God, Pentecost, celebrations, the Lindisfarne Gospels, inner strength, Mother Church, the allotment (with small pots of flowers and produce), the local coal trade, baptism and of course footprints! 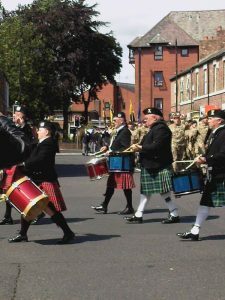 The Baptist Church hosted a free concert on behalf of Churches Together in North Shields on the evening of Saturday 24 May. For the 50 or so who attended, it was a treat to be enjoyed. John Alexander Wilson, a Christian singer-songwriter from Inverness-shire performed an evening of songs, interspersed with stories about how they came to be written, and about his faith. John sang with a strong, clear voice, and played a semi-acoustic guitar. For some songs he also ran a backing tracking enabling him to duet himself. Some of the songs arose from his reflections on God and faith, and some from people he had met, and were sung with passion. In one, he even had the audience clapping, dancing and singing along! All in all, it was an enjoyable evening’s entertainment, and a chance to reflect on our lives and faith. Technology and participation marked the ecumenical service for Christian Aid Week hosted this year by St Columba’s. During the course of the service, led by our own Revd Liz Blair, we were shown 3 short videos from Christian Aid. The first was a humorous view of the responses collectors may encounter with door-to-door collections (including mistaking them for take away meal deliveries). The second, narrated by former Archbishop of Canterbury Rowan Williams, told the story of a family in South Sudan, who were one of many helped by a local partner of Christian Aid in rebuilding their home after the civil wars. The third was entitled One Step to Change a Life, and emphasised the importance of the work done by volunteer collectors in Christian Aid Week, who brought in 75% of the charity’s income. 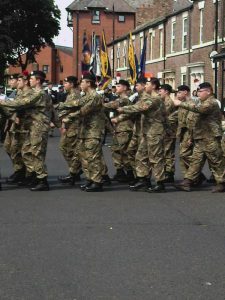 Adults and young people from various churches in North Shields took part in the service, with readings, a prayer, and a choir. The congregation of nearly 100 was in good voice, and sang the six hymns with gusto. We heard of a thrice-repeated dream about a door in the house that had never been noticed before, but which led to another house, this one in ruins. For one of our members, that was a spur to action to help others in countries where there is war, poverty and injustice. Liz heartened us that although this may seem like a mountain to climb, it was possible if taken one step at a time. Worshippers were invited to write on a cut-out footprint what step they would take. Finally the collectors were commissioned for their work in the week ahead, and after the blessing refreshments were served in the hall, as we chatted with friends old and new. An offering taken at the service raised £221 for Christian Aid, added to £578 taken at yesterday’s coffee morning, and over £100 with this year’s north east quiz: a very good start to the week!